First and foremost, welcome and thank you to any and all new readers that have come over from I Heart Organizing; I’m so glad you’re here!!! For those of you who left wonderful comments and/or questions in recent days, I’ve been trying to get the answers to you. If you haven’t heard from me, it’s most likely because your email wasn’t attached to your comment. When I could, I tried to answer your question right below your comment within the actual post, so check there! Second, I have got a DOOZY of a post for you today. Sit back, relax, maybe even go get a snack to tide you over. 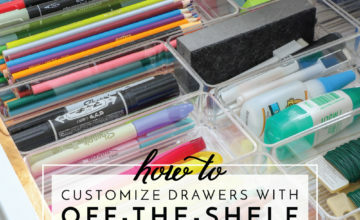 If you don’t have the time right now to peruse about 2 dozen photos and read my babble about craft supply storage, bookmark this one and come back later because I have a TON to show you! A few weeks ago, I debuted my craft station here on the blog. You can read the full reveal HERE. This space has been a long time in the making; and while I have shown you lots of photos of what you see in the photo below, I haven’t yet had the chance to get into the “nitty gritty” of how I store all of my craft supplies and notions, especially what’s down below in those cabinets. I’ve been wanting to write this post for a while – a post that shows you every last storage solution I use in this room. But alas, this post was getting WAY TOO LONG so I’m gonna break it up. If not for your sake, for mine! 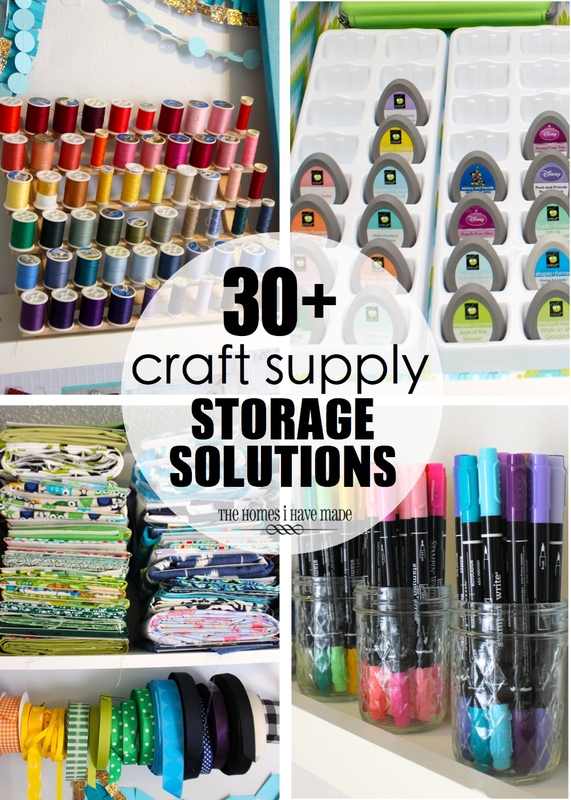 So…today, I am going to show you all the craft storage goodness contained on this one wall. And then I’ll get to the other areas of the room next week! Game? On a few occasions in the past, my mom and I have visited a ribbon outlet in Maryland where you can buy spools of 100+ yards of ribbon for very cheap. Over the course of a few trips to that store, my collection has become pretty substantial. I find having the spools hung on a curtain rod (from IKEA) makes it easier for me to access (and therefore use!) my ribbon! My thread is organized by color on a basic thread holder found in any craft store. Mine was found in my mother’s craft room – she wasn’t using it! I love seeing all these candy-colored spools on display. Not only can I find what I need super fast, but the whole display doubles as art! 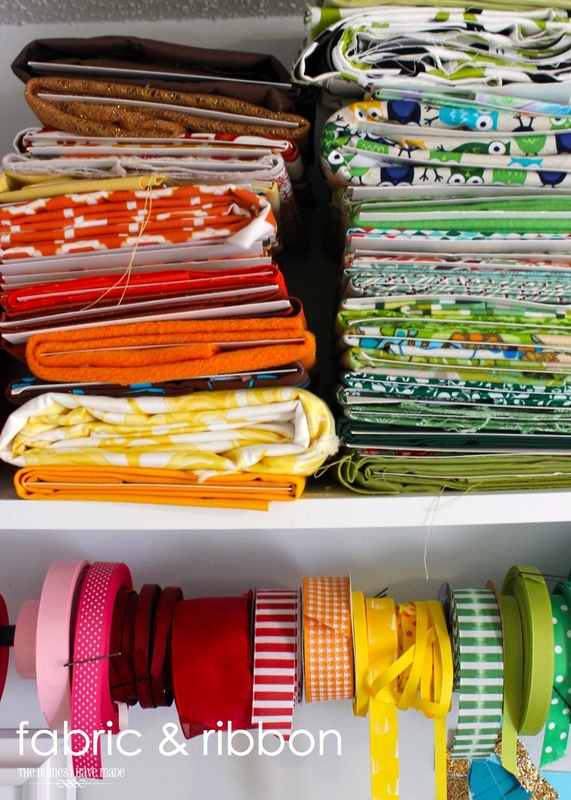 One of my most popular organizing projects ever are my rings-of-ribbon that hold my smaller ribbon sections. Like my larger spools of ribbon, having them organized and displayed on a curtain rod makes seeing what I have (and using it up) much easier! Also hung on the wall is a floating shelf to hold some decor as well as a few mason jars containing often-used items such as pens, pencils, markers and scissors. I love having easy access to all of the items every day! 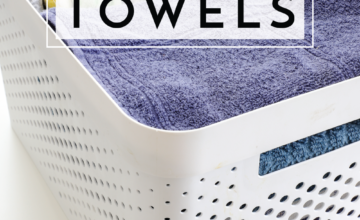 So…those storage solutions are ones you’ve already seen (especially if you’ve been coming around here for a little while). What I really want to show you is what I have stored in those cabinets below the countertop! Let’s start in the far right cabinet by the door. In general, this is my “stamping” cabinet! 8+ years ago, when I lived in Okinawa, Japan, I found these oh-so-awesome clear plastic bins in their version of the Dollar Store. Not only do they stack and are a great size, but I love that flip top, allowing for easy access to the contents inside. 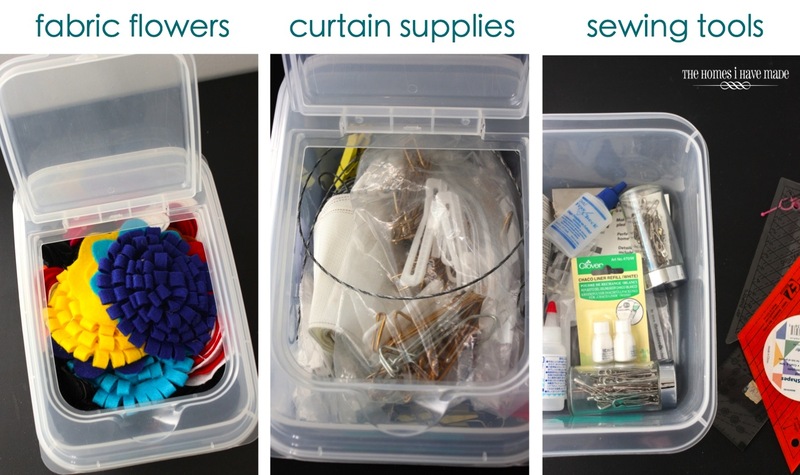 I use these bins all over my house, but mostly in my craft room. I store my ink pads in a clear acrylic box I found ages ago (also overseas! ); and all of my greeting and birthday cards are stored in an extra-long DVD box! Also shown above, all my stamps are contained into one basket (the big green one); and my paper cutters sit on top for easy grabbing. Just next to this cabinet is a basket that holds all of my vinyl and patterned contact paper. I’ve thought (and almost started!) a gift wrap/vinyl storage wall, but in all honestly, this basket works perfectly! All of these items are corralled in one spot, and I don’t have to work too hard to maintain order! The middle double cabinet holds most of my sewing supplies! Baskets and boxes corral things like bias tapes, piping and other trims; yarn; and patterns. 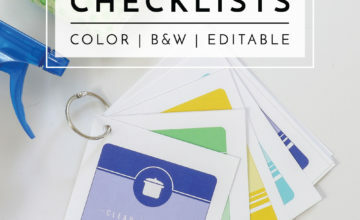 An accordion-style folder holds instruction manuals to all my crafting machines, as well as paper patterns and instructions I print off the web. A big turquoise basket is stuffed full (literally!) of batting and stuffing! Again, I put my plastic bins to work, corralling similar items. Everything from popsicle sticks and sequins to grommets and curtain hooks are sorted and labeled! The last single cabinet, all the way to the left, holds mostly my paint supplies, but some other general crafting items have inched their way in too (such as my Big Shot and dies, blank canvases, and stencils)! More plastic bins hold everything from paints to fabric mediums to tapes and glitter! 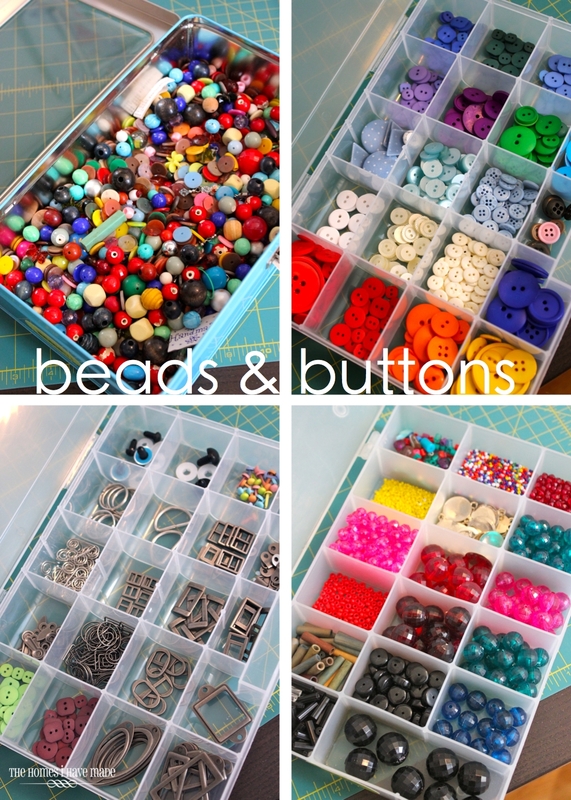 Tackle boxes hold my beads and buttons (mostly) sorted by color! One of the most important things to me when it came to making these cabinets perfectly organized and functional was not to pack them too deep. If a particular bin or tool is too hard to dig out because it’s behind a million other things, I am less likely to use it. Therefore, I tried really hard to only have one “layer”deep in all these cabinets. In the center cabinet where things are stored a little more densely on the bottom shelf, I still make sure I can get each basket or box out without too much trouble! Okay…to finish up the storage on this wall, let’s take a quick look in those drawers. 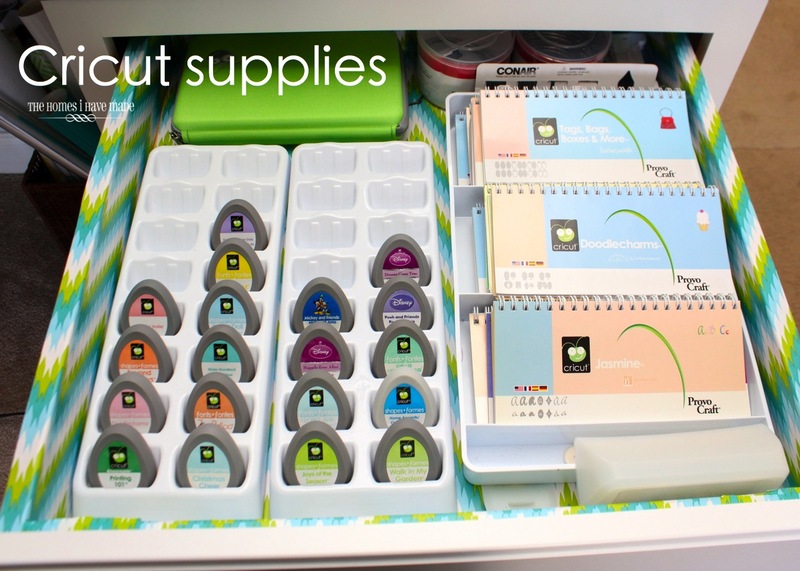 Again, on the far right, just below my Cricut machine, holds all of my Cricut cartridges and manuals. I LOVE having these at the ready right by my machine. Those organizers are from box organizers for this exact purpose. I just took the trays out of the boxes and put them right into the drawer! Below are my center two drawers. The left holds all of my sewing tools that I use almost every time I sew (basic color threads, bobbins, pins, fabric markers, needles etc). This drawer is right next to where I sew and is open pretty much the whole time I’m working on a sewing project. Of everything in this room, this drawer probably functions the absolute best! The right-hand drawer is an empty drawer that holds my current project(s). Instead of leaving in-progress projects laying around on top of the counter, I like to tuck them away here to keep them safe and clean until I’m ready to work on them again! 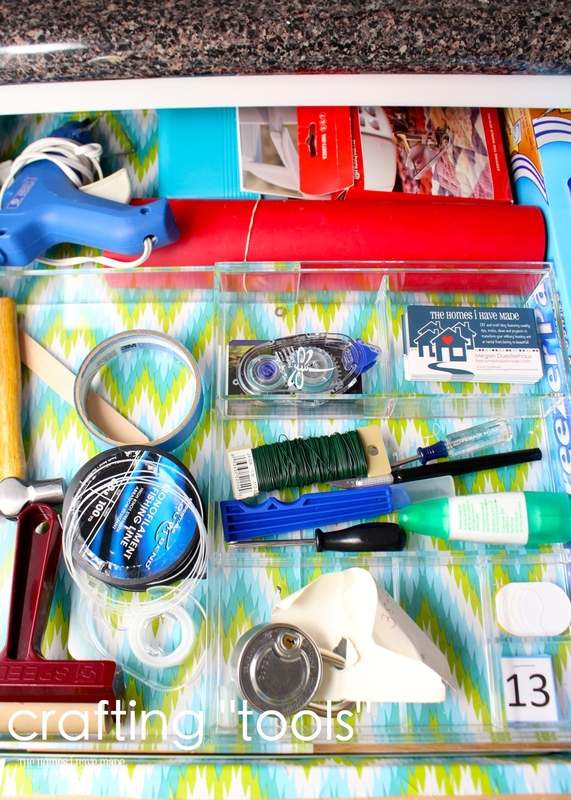 The far left single drawer holds a lot of my crafting “tools.” My glue gun, the walking foot for my sewing machine, a small hammer, a brayer, wire, painter’s tape, an Xacto knife, and adhesives are all at the ready. While my plastic bins down below are perfect for storing things I don’t use everyday, this drawer holds those items I use most so I don’t have to dig around for them every time! PHHHEEWW! Are you as exhausted as I am? Thanks for reading to the end if you made it this far! The weather around here is (finally) warm enough to start working on some projects outside. I’ve been hankering to paint some furniture and I have a piece primed and ready, so I hope to have a fresh reveal up for you here next week. Fingers crossed the weather holds out! 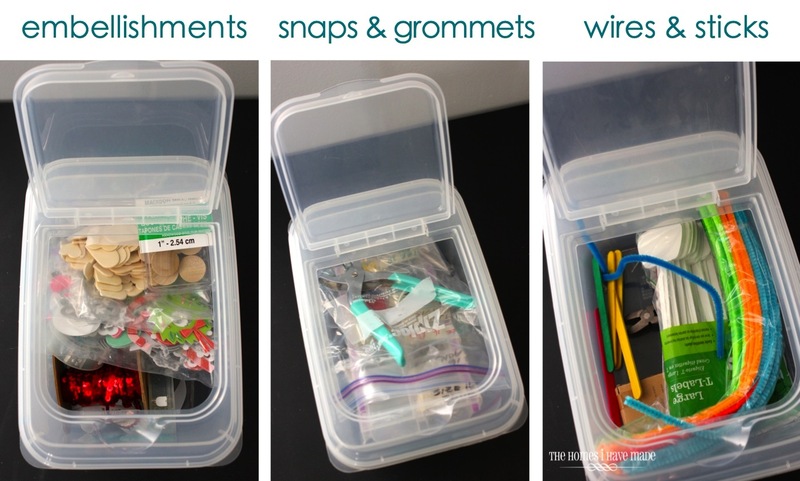 I Heart Organizing Feature Today! 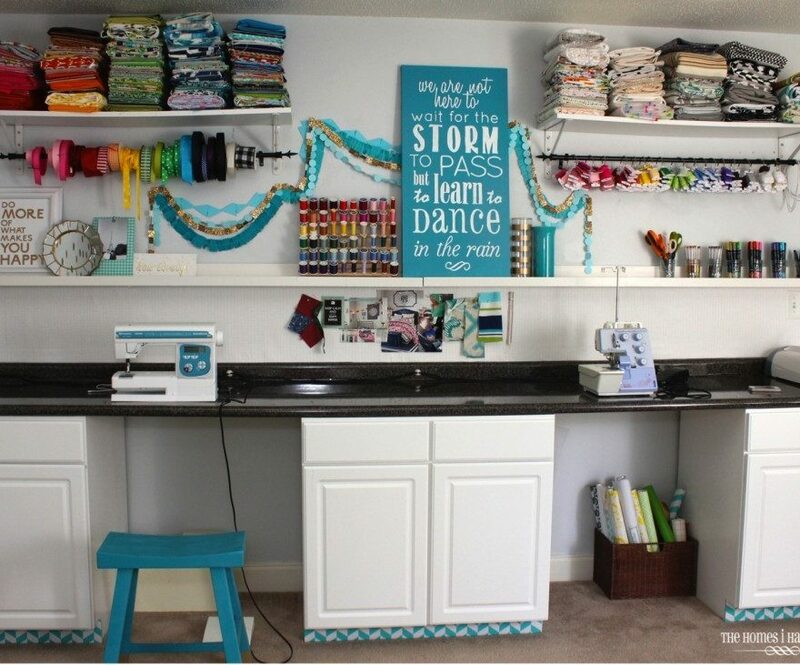 I love your craft room!! It is so fun and organized. Love it!! I've been following the progress of this room and was excited to get a peek inside your drawers. Have to admit having a total DUH moment when I read about your empty drawer for current projects. Total genius! I have a tendencyo fill every drawer and get frustrated with current projects laying out and getting frustrated. Wonderful use of space and color. Love the placement of your gold dots the most! On second look thru the post I noticed the clear acrylic divider in your sewing drawer and bobbin holder. Do you remember where they were purchased? A little pricey (actually, they are cheaper now than when I bought them!) but so worth it for the quality and amount of compartments it provides. I love that they expand to fit almost any drawer! Where'd you get that little doughnut shaped holder for your bobbin thread? I love it!! Hi Kelly, I'm not sure where I originally got it, but I LOVE it and have used it ever since I started sewing. You can get one here: http://www.amazon.com/Bobbinsaver-Bobbin-Organizer–Assorted-Colors/dp/B0009WFWP2/ref=sr_1_2?ie=UTF8&qid=1393289766&sr=8-2&keywords=bobbin+holder Hope that helps! 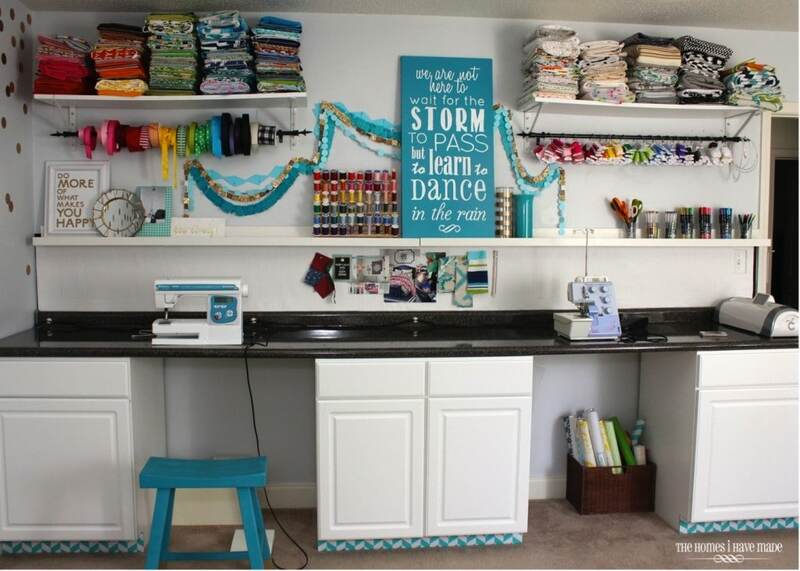 Beautiful craft room! You are so organized, I love it! I love all the colors your supplies add the the room, they are decoration themselves. Hi Megan, where did you get the green and Turquoise baskets from? I love how bright and colorful everything is! I am off to reorganize my sewing room right now LOL! Thanks for the inspiration! 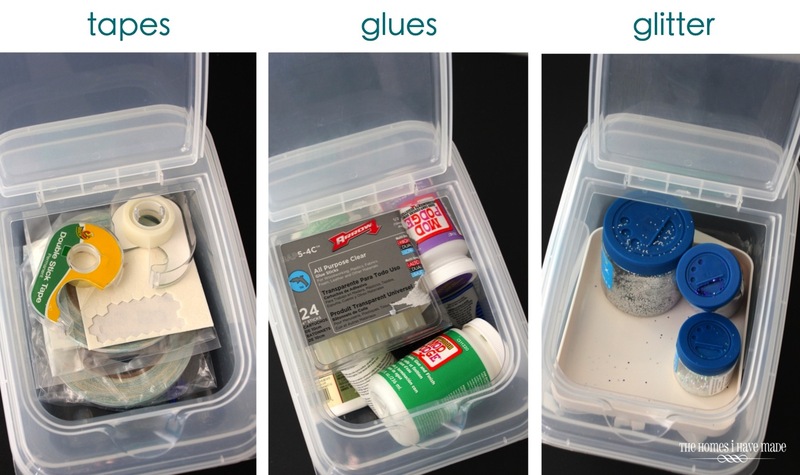 Wouldn’t you know it, this is how my luck ALWAYS goes but one of the very few plastic storage containers I see that I REALLY like comes from a store, most likely not even in business any longer, half way around on the other side of the world. I love how they have a flip top to them. I have a couple of questions. 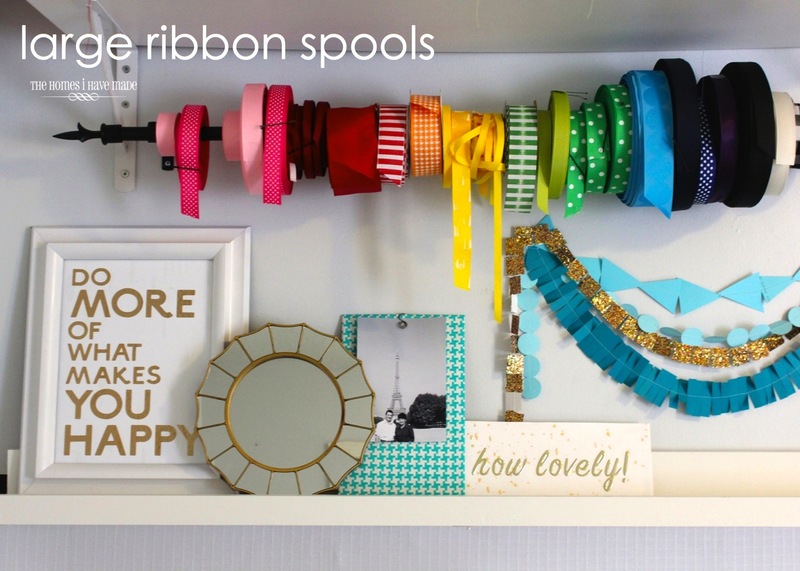 First, how do you get a spool of leftover ribbon off of the “curtain storage rod”? Next, I’ve been working for two years rearranging rooms, doing away with a home office and moving a library into that space. Then, what was the library I’m changing into a large walk-in closet and dressing room. I also want to organize the TON of Christmas decorating supplies in my attic and I spent this entire past winter, once Christmas was over, working on a systems for the TON of baking, cooking and especially cake decorating supplies along with all the items for making gingerbread houses. For most of the food and edible items, which ended up using about 5 times the space I had imagined it would take when I used a system of canning jars. I have items in every size and shape of canning jar you can imagine and I LOVE it. Anyway, two items I’ve been searching and searching and searching for but can’t find are ATTRACTIVE 3-ring binder notebooks, something with a 2 or 3 inch spine at the very least. I don’t think they make any. Also, I have lots and lots of magazines I don’t want to toss but rather I want to store them in the magazine bins which can be store in book shelves. I can’t find any that I think are attractive. Have you ever decorated either the 3-ring binders or the magazine holders or know of a site which sells nice looking ones? The problem is, I live in a 200+ year old house so I tend NOT to have items which look ultra-modern and so far that’s all I can find.